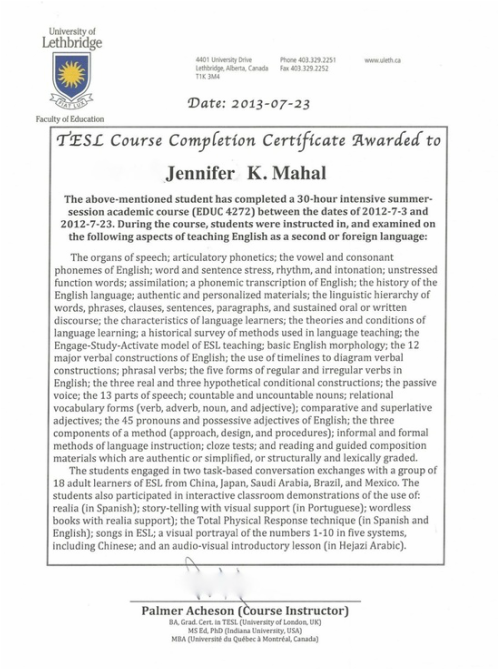 As an education elective I decided to take a course in how to teach English as a second language (TESL). This course was taught in a three week period where I believe I learnt amazing techniques in how to teach a language. Having said this, I believe these skills are completely transferrable to teach any subject. A worthwhile experience of this course as mentioned in the certificate was the interaction with students who have migrated to Canada and are learning English as a second language. As an educator it made me more aware of how I spoke and the gestures as these students were very carefully observing both. On the whole, this was a course where I learnt new methods of teaching.